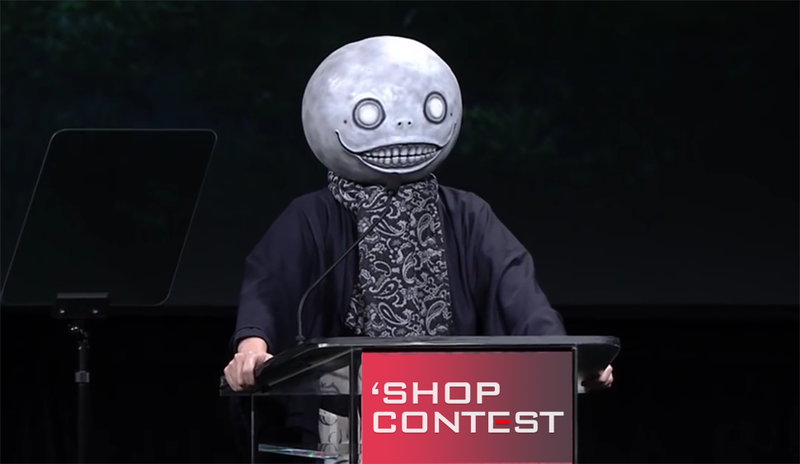 One of the creepy highlights of Square Enix’s 2015 E3 press conference, now a major Kotaku ‘Shop Contest subject. Why is he wearing that mask? Why isn’t everyone wearing it? Video game director Taro Yoko is responsible for the wonderfully dark and twisted Drakengard series and its Nier spin-off (soon to be spin-offs), so as far as I am concerned he can wear whatever he wants in order to support his belief that game designers are not entertainers and his desire not to be seen on camera. I quite fancy the moon-mask he wore at presser though. It’s actually the head of a Nier character I will not go into to keep from spoiling anything (play Nier, dammit), but for the sake of simplicity we’ll simply call it a moon-mask. And we’ll put it all over the place. Using Photoshop. Or Paint. Or that other thing people use. Just spread the head, people. We’ll reconvene next weekend to see how far it goes. Here’s a larger version of the original version, grabbed from the official press conference video. If anyone wants to isolate the mask and upload as a PNG to make it easier for the less-skilled in the audience, drop it in comments and drown in accolades.